Over the course of his storied career, Elvis Costello appeared on David Letterman’s Late Show an astounding 27 times — he was the kind of regular who even once filled in for Letterman while he was out of commission. Search the back halls of the Ed Sullivan Theater right now, and we can only imagine there’s a dressing room with Costello’s name still engraved on it. Even with Letterman deep into retirement, Costello stops by every now and then to pay Stephen Colbert a visit. 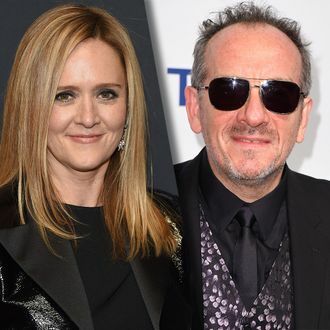 But he’s now got a new friend on late-night TV to support: On April 29, Elvis Costello & the Imposters will play the official after-party for Samantha Bee’s inaugural Not the White House Correspondents’ Dinner in Washington, D.C. It’s the alternative to the, uh, other White House Correspondents’ Dinner, happening the same night, where Sam Bee will salute the media and all proceeds for the event will go to the Committee to Protect Journalists. New York and Vulture are co-hosting the shindig, which will give a “crowd of hardworking journalists” honored at the dinner a well-earned night off from corresponding with the president. It’ll air on April 29 on TBS at 10 p.m. ET. Cheers!